Mansfield Town were denied an opening day win against Carlisle United after Jabo Ibehre’s goal in first half stoppage time. Stags started the first half well and went ahead through a thunderous 30 yard free-kick from Malvind Benning on 29 minutes. But Ibehre calmly slotted past Scott Shearer in the second half of stoppage time to give the visitors a get out of jail card. Stags had bossed large periods of the first half and will have felt hard done by to go in level at the break. Mansfield came out fighting in the second half but failed to find the same dominance in possession and creativity, espeically in wide areas, as they had enjoyed in the first half. 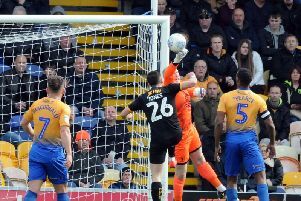 Chris Clements twice went close with shots over the bar, before Matt Green fired a shot agonisignly wide in second half stoppage time as Mansfield were left settling for a point. Boss Adam Murray named new signing James Caton on the bench. The winger (21) joined Mansfield on loan from Shrewsbury and became Mansfield’s 14th summer. Star signing Matt Green was named in the starting eleven following his summer return from Birmingham City. There were also starts for new men Nathan Thomas, Nicky Hunt and Malvind Benning. United had the first sniff at goal after nine minutes when Patrick Brough failed to keep his shot down as he fired over the bar. Reggie Lambe continued to look lively as he scuffed a tame shot at Mark Gillespie on 11 minutes. Nathan Thomas had a shot deflected over the bar by Michael Raynes on 16 minutes after Carlisle were caught napping in their own box. Matt Green then had a snapshot smartly blocked from the resulting corner as Stags continued to push. And Stags hit the front in spectacular fashion when Malvind Benning opened his account with a thunderous 30-yard free-kick into the top right corner. It was a goal of the highest quality and gave Gillespie absolutely no chance. Carlisle responded well with Scott Shearer palming away Jason Kennedy’s long range effort on 36 minutes. And the visitors levelled through Jabo Ibehre in first half stoppage time after he cooly slotted low past Shearer following a one-two with Derek Asamoah. The goal came out of the blue and was a real blow for Mansfield who had dominated large parts of the first half. Lambe had the first half chance for Stags after the break when he neatly turned Danny Grainger before shooting well wide on 55 minutes. Chris Clements fired a firmly hit shot a foot over from distance on 68 minutes after a patient build-up from the home side. Three minutes later Clements again when Close as Murray’s men pushed for the winner. Asamoah was inches away from connecting with Angelo Balanta’s cross on 76 minutes as the momentum began to swing. Subs: Jensen, Beardsley, J. Thomas, McGuire, Caton. Carlisle United (3-5-2): Gillespie, Miller, Atkinson, Raynes, Grainger, Brough (Balanta 71), Joyce, Kennedy, Hery (Dicker 87 n/a), Ibehre, Asamoah. Subs: Hanford, Wyke, Osei, Archibald-Henville, McQueen.